Download my free goal setting playbook to get started on reaching new levels of productivity and performance. 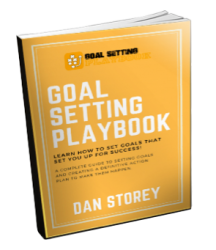 This workbook brings combines the best goal setting processes with the latest psychology behind goal setting success to ensure you exceed even your own expectations. Dan Storey is a psychologist and NLP trainer, specialising in the psychology of decision making. Having trained thousands of sales people over the past more than ten years, Dan knows what it takes to get people to make the right decision, and uses this understanding in both his training and personal coaching. Dan is the author of Next Level Persuasion, teaching the tools and techniques from NLP to sales people, and works with sales teams around the world helping them to incorporate this new model of influence and persuasion in their sales processes. Personal 1-1 coaching with Dan is one of the best ways to achieve your goals and accelerate your success. WARNING – this is not for the faint hearted, as Dan focuses on holding you accountable to your goals. Also not for you if you don’t like sports metaphors! If that doesn’t put you off, and you are looking for a life coach to help you with your goals, contact Dan by clicking here to arrange a free consultation. Dan’s trainings focus on sales, leadership and peak performance. Using techniques from NLP (neuro-linguistic programming), Behavioural Psychology and DiSC profiling, Dan draws on his extensive experience of both corporate trainings and motivational seminars to ensure you learn both the theory and application of all topics. Contact Dan to enquire about training at your organisation. Dan’s keynotes cover a range of topics related to psychology and personal development. A keen student of the science behind popular psychology, Dan translates theory into practical tactics that you can apply immediately. Check out Dan’s blog for more ideas on his topics and themes and get in touch if you need a motivational speaker for your event. Next Level Persuasion teaches best goal setting techniques to sales people to make them more powerful with the tools of influence and persuasion. 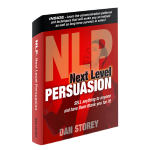 Having taught NLP for sales people for over 10 years, Next Level Persuasion brings together both practical sales tools as well as the neuro-linguistic programming and psychology principles to help understand both how and why these techniques work. 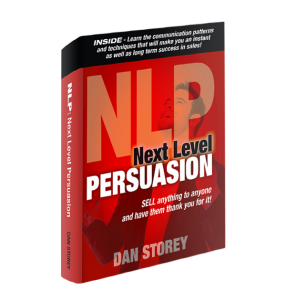 This book is written for sales professionals who realise that NLP can help improve their ability to communicate with and motivate their prospects, with integrity, to help people make good buying decisions. Goal setting is the first step on every successful journey. There are so many different approaches to goal setting, but this is my goal setting playbook that I go through at least once per year. The goal setting playbook takes you through a process where you outline your goals, dive into your motivation for achieving them before creating an action plan that will ensure you get started and stay on track. This is a free download, so take some time out and plan what the rest of your life is going to look like.